If you are into surfing, Dubai might just be the best place for you. The wave climate, warm water and sunshine all through the year make Dubai a surf enthusiast’s place to be. Surfing in the desert under Burj Al Arab is something to be boasted about to friends after the vacations. The beaches here are perfect to surf because they have sandy bottoms which prevent any reef injury. Plus the waves are small and medium sized, suited to someone who wants to learn. The water is warm so you do not need a wet suit. Our step by step guide is here to make your vacations a whole lot interesting and introduce you to a sport that is bound to become your favorite one. The first step is to register with a surfing school. Dubai has only one surfing academy right now which teaches surfing under international standards and provides equipment. The school was founded in 2005 and till date is the only official surfing school in Dubai. The owner Scott himself is an instructor and personal coach and takes surfing as a passion. The school has programs classes for school children, girls, mums, private and group lessons with different fee. With instructors qualified by International Surfing Association standards, the school provides private surfing lessons all through the week while group sessions are held on weekends. The instructors and lifeguards work with you through the levels to boost confidence. Classes are usually 90 minutes long with half an hour instruction and one hour practice. If you reach a level where you can surf on your own then you can just rent a surf board for an hour which costs 75dhs or a day for 200 dhs. They are located at Umm Suqeim open beach. The surf school provides you with the equipment while you have to bring your own towel, swim suit and sun screen. The school provides its own equipment made by quicksilver. You can also rent our equipment from the surf school.The surfing boards are soft and stable for a fun surfing session. 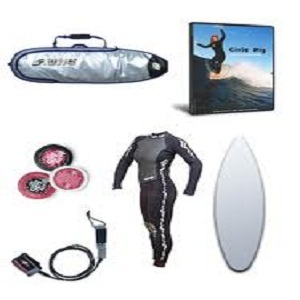 The surf school also has an online shop from where you can buy the equipment of your choice. You can also get personal surfing board from a sport shop located around the city. One famous shop is the surf shop Arabia which has a complete range of surfing equipment and is a partner of the Surf school itself. Now, its time for you to enjoy the water world.